Twenty-one IC students worked as flash quoters for the Olympic News Service in Beijing. I don’t know about you, but I have used my cell phone more than a handful of times in the States while it was raining and never had any problems. A group of us came across this sign while at lunch one afternoon, reminding us that we truly were halfway around the world. Automatic Guide 40 RMB: It's Automatic. You Needn't Any Work When You Get the Every Place. Um, in English, please. I saw this sign while at the Beijing Zoo, which, like most things in China, was huge. This sign is truly one of a kind and perfectly represents the difficulty in translating Mandarin to English. Study sport media and journalism at IC. Last summer I went to the Beijing Olympic Games. Okay, so I wasn’t competing in any events, but I did experience the games firsthand -- as an intern for the Olympic News Service (ONS). As a journalism minor, I was excited by the opportunity. I looked forward to learning more about the journalistic process and was eager to apply what I’d learned in class to this experience. 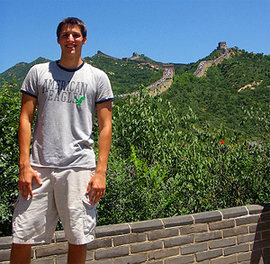 I had never studied abroad and thought that spending two months in Beijing working for the Olympics would be the next best thing -- if not better. I quickly found out that all is not equal in journalism in different countries, and I left China with a sense of pride in my country’s news reporting system. 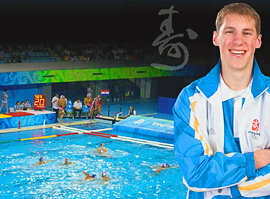 The author covered water polo for the Olympic News Service. The process of being selected for the ONS program took more than a year. It included applying for the internship, organizing our group, and finalizing the details of our trip. In the end, 21 Ithaca College students were accepted as ONS flash quoters (flash quotes are sound bites from athletes), and each of us was assigned to a specific sport at the games. I was assigned to cover water polo, and although I had no prior knowledge of the sport, I learned to enjoy it for the physicality, endurance, and sheer talent of the competitors. 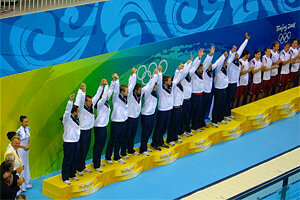 The United States men's water polo receives the bronze medal. During the first month of our 51-day trip, we spent time at famous landmarks like the Great Wall of China, the Forbidden City, and Tiananmen Square and became familiar with our surroundings. I was surprised by many things in China. The food was unique to say the least, the streets and buildings were jammed with residents, and driving rules were basically nonexistent. But the thing that shocked me the most was the difference between American and Chinese journalism. During the games I spent most of my time watching water polo matches and interviewing athletes and coaches to gather quotes. The ONS essentially served as the Associated Press for the Olympic Games. As Americans, we take for granted the wide array of information American media provide to the public. The same cannot be said for Chinese media. There is only one television outlet, which is state run, and the sole newspaper is also state run. As you’d probably guess, radio is also run by the state. While state regulation of media came as a shock to me, I was also surprised to find that my Chinese friends did not think twice about the media services in their country. Some Americans may not like Fox News, but we forget that we are allowed to listen to different viewpoints. Others are not so lucky. Rather than getting news from objective sources, Chinese citizens receive their news directly from the state without an interpreter. What is said goes, and people don’t question the legitimacy of the claim. Take for example the controversy surrounding the real age of several Chinese gymnasts at the games. While in China, I didn’t see or hear anything about officials from other countries questioning the age of the gymnasts. Yet in America, this story was being reported from all angles -- the views of the Chinese team and those of other teams. In China, it was as if the controversy didn’t exist. This story is a perfect example of how the Chinese government regulates the flow of information to the public. When I enter the field of journalism after graduation, I will relish the ability to investigate claims without being spoon-fed the news. It is true that news serves a different function in China than it does in the States, but that doesn’t mean that we can’t be proud of our system. The experiences I had in China helped give me a better understanding of what makes good journalism. I’ve seen two different cultures reporting the news, giving me an understanding of what people want, need, and crave.